Stone decks are extraordinarily durable, but they do need to be repaired from time to time. 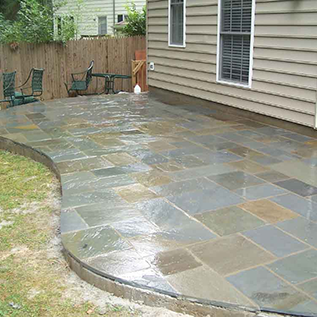 For complete deck repair in Jacksonville, FL, depend on the reliable stone deck repair specialists at Alpha Natural Stones Plus. We have more than 25 years of experience performing a wide range of hardscaping services, including deck repairs, so we know how to make your deck look like new again. In addition to repairing decks, we also offer a wide range of other hardscaping services. If your stone deck is affected by one or more of these issues, now is the perfect time to hire us as your deck contractor. We'll repair your deck quickly so you can stop worrying about it. Get back to enjoying your deck with our convenient repair services. When hiring a deck repair company, it's important to work with someone you can trust and depend on to get the job done right. Improperly performed repairs could cost you more money in the end. We understand how important your time and money is to you, and that's why we place such an emphasis on providing efficient services and attentive customer care. You can trust us to correct your deck's problems without overcharging you or rushing the job. Our deck specialists won't be satisfied unless you're happy with their work. If you're in need of services, get in touch with us today for a free estimate. We look forward to meeting all of your deck repair needs. Contact us when you need your deck repaired. We serve our customers in Jacksonville, Ponte Vedra Beach, Jacksonville Beach, Atlantic Beach, and Neptune Beach, FL.